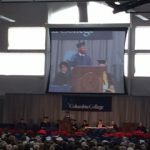 On December 16, 2017, D”Markus Thomas-Brown who leads the plant in Columbia (Convergence Church ) was given a great opportunity to give the commencement address for Columbia College. D’Markus completed his MBA and the school selected him and one other student to be the speakers for the graduation ceremony. This was the first time in the history of the school that students handled the commencement address. 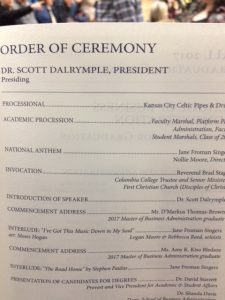 D’Markus addressed more than 300 graduates as well as a crowd 1000+ people. Friends, family, and the Convergence family attended the event to encourage D’Markus. D’Markus began his address to the packed arena with the words “First of all I want to thank my Lord and Savior Jesus Christ for making this all possible!” The speech was anointed and very moving as he filled the speech with quotes from God’s word addressing real-life issues and perspectives. The school website reported the following about the speech. Thomas-Brown works as an account manager at MBS Textbook Exchange in Columbia and is also a church pastor, so he has experience speaking in front of groups. He had never had the opportunity to speak to a crowd the size of the one that packed into Southwell Complex. Many of you will remember D’Markus’ story from July 27, 2017, of how his mother sent him to Kirksville to encounter God during his formative years as he was struggling in Columbia with his life heading in a bad direction. As she said, “I would rather lose him to God than to the streets of Columbia!” Read the story here. We continue to see the fruit of this decision in things like his accomplishments. Great Job D’Markus and may God continue to open doors of favor through your life and efforts. The College website story can be found at the following link. Columbia College Commencement Ceremony.